As a radiation oncologist, vice chair of UR Medicine's Department of Radiation Oncology, and Director of Wilmot Cancer Institute's Judy DiMarzo Cancer Survivorship Program, my professional life is guided by, in my own words: "For the survivor of cancer, the world is full and each day is a celebration; For the physician, each patient is an inspiration; For the person with cancer, each day is precious and must be faced with courage." I am fortunate to spend my life striving to help patients with cancer, optimizing their quality of life and curing them when possible. My patients, especially young children, have taught me to appreciate my own life ... to not take it for granted. It is our responsibility and goal to devise strategies to maximize the curability or palliation of cancer, while minimizing the adverse effects of treatment. 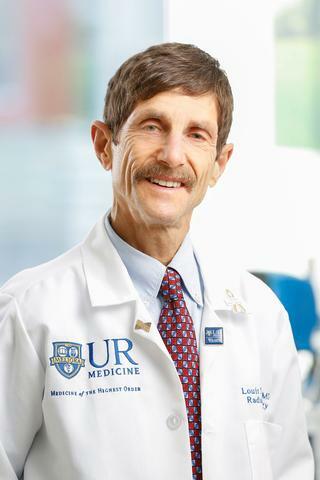 My areas of expertise and special interest include protocol design for patients with lymphomas, sarcomas and childhood cancers, as well as cancer survivorship including the long-term effects of chemotherapy and radiation therapy on normal body tissues and the generation of secondary malignancies. Al-Mansour Z, Li H, Cook JR, Constine LS, Couban S, Stewart DA, Shea TC, Porcu P, Winter JN, Kahl BS, Smith SM, Marcellus DC, Barton KP, Mills GM, LeBlanc M, Rimsza LM, Forman SJ, Leonard JP, Fisher RI, Friedberg JW, Stiff PJ. "Autologous transplantation as consolidation for high risk aggressive T-cell non-Hodgkin lymphoma: a SWOG 9704 intergroup trial subgroup analysis." Leukemia & lymphoma.. 2019 Jan 10; :1-8. Epub 2019 Jan 10. FitzGerald TJ, Donaldson SS, Wharam M, Laurie F, Bishop-Jodoin M, Moni J, Tarbell N, Shulkin B, McCarville E, Merchant T, Krasin M, Wolden S, Halperin E, Constine LS, Haas-Kogan D, Marcus K, Freeman C, Wilson JF, Hoppe R, Cox J, Terezakis S, Million L, Smith MA, Mendenhall NP, Marcus RB, Cherlow J, Kalapurakal J, Breneman J, Yock T, MacDonald S, Laack N, Donahue B, Indelicato D, Michalski J, Perkins S, Kachnic L, Choy H, Braunstein S, Esiashvilli N, Roberts KB. "Larry Emanuel Kun, March 10, 1946-May 27, 2018." International journal of radiation oncology, biology, physics.. 2019 Jan 1; 103(1):8-14. Epub 2018 Dec 12. Clemens E, van den Heuvel-Eibrink MM, Mulder RL, Kremer LCM, Hudson MM, Skinner R, Constine LS, Bass JK, Kuehni CE, Langer T, van Dalen EC, Bardi E, Bonne NX, Brock PR, Brooks B, Carleton B, Caron E, Chang KW, Johnston K, Knight K, Nathan PC, Orgel E, Prasad PK, Rottenberg J, Scheinemann K, de Vries ACH, Walwyn T, Weiss A, Am Zehnhoff-Dinnesen A, Cohn RJ, Landier W, . "Recommendations for ototoxicity surveillance for childhood, adolescent, and young adult cancer survivors: a report from the International Late Effects of Childhood Cancer Guideline Harmonization Group in collaboration with the PanCare Consortium." The Lancet. Oncology.. 2019 Jan 0; 20(1):e29-e41.